We’ve all done it. You’re walking out the door or maybe you’ve even gotten on the road when the question hits, “Did I leave the [coffee pot | stove | hair curler | soldering iron ] on?” [Daniel Johnson’s] problem was even worse. He couldn’t tell if his Hakko-936 soldering iron was off because the LED indicator wasn’t always on. Instead it flashed. He fixed that problem and along the way hacked his battery powered soldering iron since he was out of batteries. Now that’s perseverance. The Hakko’s LED turned on whenever the power turned on to heat the tip. That was about every 5 seconds once the tip was hot. But just as a watched pot never boils, a watched LED never seems to flash. After determining the LED was driven by a comparator he decide to unsolder it as part of his hack. He wisely decided using the Hakko on itself was not a good idea so reached for the battery-powered portable iron, which was sadly battery-free. Undaunted, he wired the portable to a power supply and when 4.5 volts didn’t melt the solder cranked it up to 6 volts. Back to the Hakko, he replaced the red LED with a RBG LED but used only the red and green leads. The green was tied to the 24v power supply through a hefty 47k ohm resistor, and the red was tied to the comparator. A little masking tape to hold things in place and provide insulation finished the job. Now when the Hakko is on the green LED is lit and the red LED shows the heating cycle. Quite clever. That’s really clever… What a great hack! My simple solution to (almost) the same problem. We put an 8 hour version of one of those mechanical timers on our AC unit at the office after it got left on the first weekend. That’s a much better solution then some I have seen where they make it wifi enabled and connect it to the internet. Best solution I have seen. Simple and reliable. Congrats. The best way to be sure that you turned off the soldering iron is to add a piezo beeper to it. It should beep every 20 seconds. It makes soldering so annoying that you really really want to turn the iron off. I thought you were going to say: “is to touch it”. I recently left an iron on for about 24 hours haphazardly and naturally it self destructed (and luckily didn’t cause any other issues like burning my house down). My fix was an in-line mains lightswitch with a backlight, I mounted it after the handle. Works a treat. Obviously this is an iron that is just a 240VAC cable running to the wall. My proper temp controlled iron – I don’t forget about, I’m religious about turning it off and it has a display so I notice it. One reason I exclusively use Metcal is because I am convinced it is impossible to destroy one of their tips through negligence. Not only that, they monitor the power to the tip, and if there’s no appreciable load for a while will turn off. At least the ones we have at work do this. You could probably do something similar with a micro watching the “at-temp” comparator output on any iron with a control loop going through the base like this Haako. While I was working in through-hole assembly, I noticed that you can watch the power draw of the tip in a Metcal and estimate when the trace has heated up sufficiently that the solder has wicked all the way through to the other side. Point being that the PID automatically increases power when the tip gets colder, and once the PBC traces/vias and component legs have warmed up it starts to decrease power. Once it reaches a (almost) steady state that means the temperature at the solder has reached steady state, which means the solder is no longer wicking and spreading appreciably. The specs required to apply heat for x-amount of seconds per particular point, which complicated the assembly somewhat and could cause burns and delamination of the board. The pass-fail criteria was 50% which meant the solder has to wick at least 50% the way through to the other side, as seen in X-ray inspection. I noticed I could get a 100% joint with less time watching the meter. Then the company laid me off. Many years ago I was soldering a small project (probably an ATtiny or something related, I forget) late at night, and when done I set down the cheap $15 iron and unplugged the power cord, and went to bed. I overslept and rushed to work in a hurry in the morning, and didn’t notice anything amiss. When I got home, I was greeted to that hot iron smell… I *didn’t* unplug the power cord, apparently, though I could have sworn I had (it wasn’t partially unplugged like I failed to remove it entirely, it was still solidly plugged in – so obviously I hadn’t unplugged it in the slightest). I have a powerboard which powers everything on my bench including soldering iron, radio and roof mounted fluros, the idea being that it’s hard to leave the lights and music on when I leave and the one plug kills them all. I’m in the midst of cooking up a power board for my bench. Again, one switch to rule them all. Dave Jones (EEVBlog) explained how to do it ages ago. He modified a HAKKO FX-888, but explained the schematic to the details. Just to stay on the positive side – don’t do this with a 936 clone without rechecking what you’re doing. Both Dave and Daniel gave nice pointers what to look at, and how to do it. The article’s solution is more elegant and has less of a fail story, but the fail story in the dave jones video is interesting and you learn something from it. And incidentally, it’s funny how forgiving he suddenly is compared to his ‘awful device tear-down’ videos. And how forgiving he is with himself using hot glue, in a narrow space too, But hey, he’s only human. He almost looks Brent Spiner’s long lost brother in that youtube thumbnail. Or just drill another hole under it. Or just get one of those bi color LEDs in the same form factor. My Weller stays on for days at a time, it isn’t something I really think about. Are these Chinese ones really so bad. I do turn my Aoyue off usually but mainly because the hot air blowing gets on my nerves. Hakko is a Japanese brand. We have a security-guard that comes by every evening to check if all the windows are closed anyway. He is instructed to shut down any soldering stations that are still running too. In the last company we had a little collector-jar where you had to put in 10$ everytime you forgot to shut down the soldering stations. The idea was to do something with the money once there was enough collected, but it worked so well that there wasn’t even enough in there to buy a beer for everyone. My old Weller 921Z soldering station (very hard to find information about it on the net) already uses this red/green LED trick. I used a weller wecp-20 when I worked in an electronics repair shop. It had a lighted power switch on the front panel and a separate heater LED. But Weller is a little more expensive than hakko, even second hand on eBay. I may have to try this out with my Hakko clone 2-in-1 hot air station. It’s obvious enough by the bright red LED temp display when the hot air side is left on, but the soldering pencil side has the exact same issue shown here. This is a clever and even somewhat elegant solution, and I already have the parts on hand to do it (I buy cheap RGB LEDs by the 50-count from Amazon, so I always have a few kicking around). I did almost the same thing. Except instead of a massive dropper resistor, I used a capacitive dropper and a smaller inline resistor to dissipate the excess current during the initial power on surge. works great. 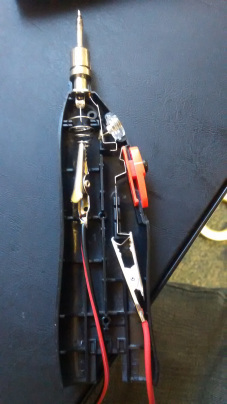 One way would have been to just replace the capacitor, so that the led flashes e.g. twice a second. I once had to repair the wiring in the Weller, and as luck would have it, had a spare 12V iron and a spare car battery with which to effect the modifications.